Pet Food, Can You Handle The Truth? Ingredients were in the spotlight during the melamine mess that incited the largest recall in pet food history. The period of time it took companies to understand the problem surprised and angered the public. Thousands of pets died during the waiting period. That disaster put people on notice – find out everything you can about your pet’s food, it could save their life. Don’t fall for false advertising, and don’t blindly trust a corporation because you like their commercials. Four years later, little has changed on the big issues: Open communication with the public by major pet food companies has yet to begin. Susan Thixton was on a mission to bring pet food ingredients into the public conversation years before the 2007 deaths of so many cats and dogs. 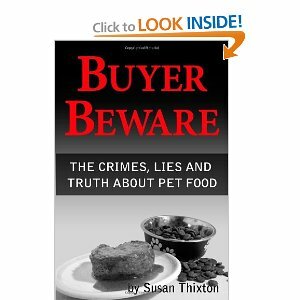 With an eye on ingredients, toxics in processes, and chemical additives that have proven to be harmful, sometimes deadly, to pets, Thixton has rooted out many truths about pet food safety, often from the mouths and records of the FDA. Her inquiries have revealed many problem areas not only in lack of and gaps in oversight procedures, but a deliberate practice by the FDA to look the other way when it comes to enforcing regulations the pet food industry ignores. A whole new kind of recycling business has sprung from this practice that takes care of the question of what to do with sick and diseased animals, those who die while waiting to be slaughtered, and more. Not a pretty picture. Thixton had the opportunity to speak to the FDA, asking how it was possible and why they would allow corporations to ignore the Food and Cosmetics Act, part of which says that the industry’s new recycling of diseased parts business should not exist. She must have caught them off-guard – you won’t believe what they said. If this news about pet food ingredients and safety is somewhat new to you, buckle up – it’s gonna be a bumpy ride! Join us in the Chat Cafe Wednesday at 9pm EST – Thixton will be there to answer your questions and talk about her favorite topic and one of mine, the truth about pet food. This entry was posted in Animal Welfare, Mary Haight, Pet Foods and tagged ingredients, pet food industry, pet food safety, Susan Thixton on April 25, 2011 by Mary Haight.